Have you ever heard of the Keto diet? I hadn’t until a few weeks ago. Melissa from I Breathe… I’m Hungry… posted a 3 day Keto Kickstart and I decided to give it a try. Basically Keto is low carb (less than 20 grams of carbs a day), but high fat. If you are familiar with paleo, I feel that it is pretty similar to that, except you can eat cheese. And I love cheese! For me this meant cutting out basically all the treat and sugar goodies I eat. It wasn’t isn’t easy, but with the results I’ve seen, it is totally worth it. On day 8 I had already lost 10 lbs! It has slowed down a little bit since then, but I’m still super happy with my results and am going to stick with it strictly for a full 30 days. We’ll see what happens after that, I really love my cookies, but I can do anything for 30 days (even not eating any cookies, while developing dozens of cookie recipes for my upcoming cookbook)! After her initial Keto Kickstart post, Melissa started posting 7 day menu plans every weekend complete with recipes, shopping list, and all your nutrition facts. You can also easily swap out a dish for another one that has a similar carb count, because all the information you need is right there. Melissa has made it soooo easy! 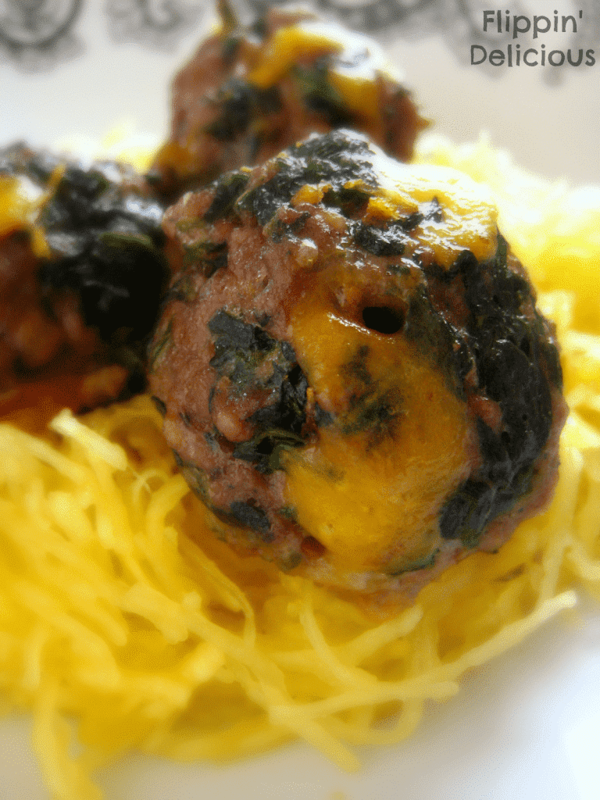 I saw a recipe for Sundried Tomato Feta Meatballs on Melissa’s Week 1 menu plan, which inspired this recipe for Spinach Cheddar Meatballs. Who doesn’t love ooey gooey cheese? And in a meatball? Yum! Full of oozing cheese and bits of spinach they make a great entrée for dinner, or even an appetizer. The spinach helps to lighten it up a bit to keep it from being too rich and the egg holds it all together. 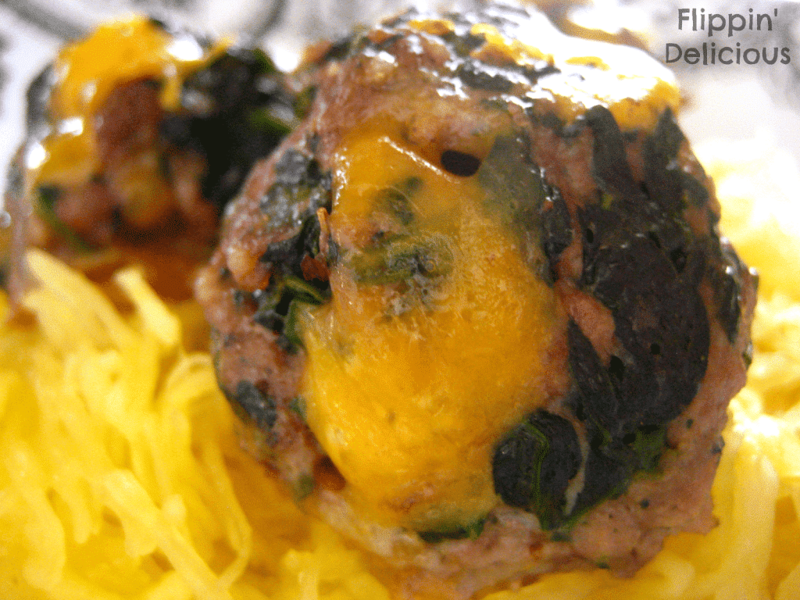 These meatballs are packed with flavor, and they are good for you too. I ate mine on top of some spaghetti squash, but you can eat them just by themselves too! Mix together all ingredients together in a mixing bowl. Divide into 12 portions and roll into balls. Bake in a 375F oven for 20-30 minutes, or until cooked through. You could alternatively pan fry your meatballs until they are cooked through. 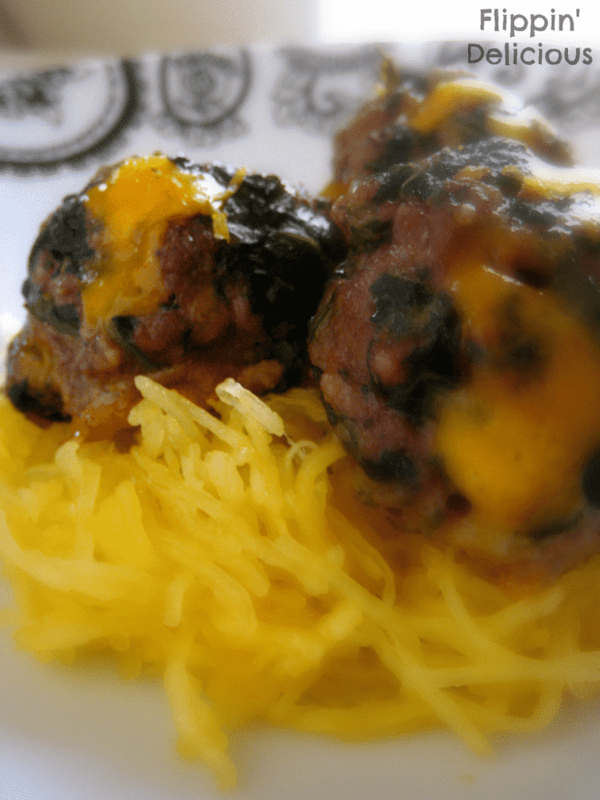 Some cheese may ooze out of the meatballs, you can trim it off, or eat it. Either way. I’d definitely use lean ground beef, so that you don’t have super greasy cheese all over. Do you follow me on Instagram? Be the first to see what I’m cooking up!